Spring is a beautiful time in Tuscaloosa, Alabama. My yard is filled with large, George Tabor azaleas and dogwoods. I picked some azaleas along with some loropetalum and set them in a window. When the afternoon sun hit them, the colors were too pretty not to paint. 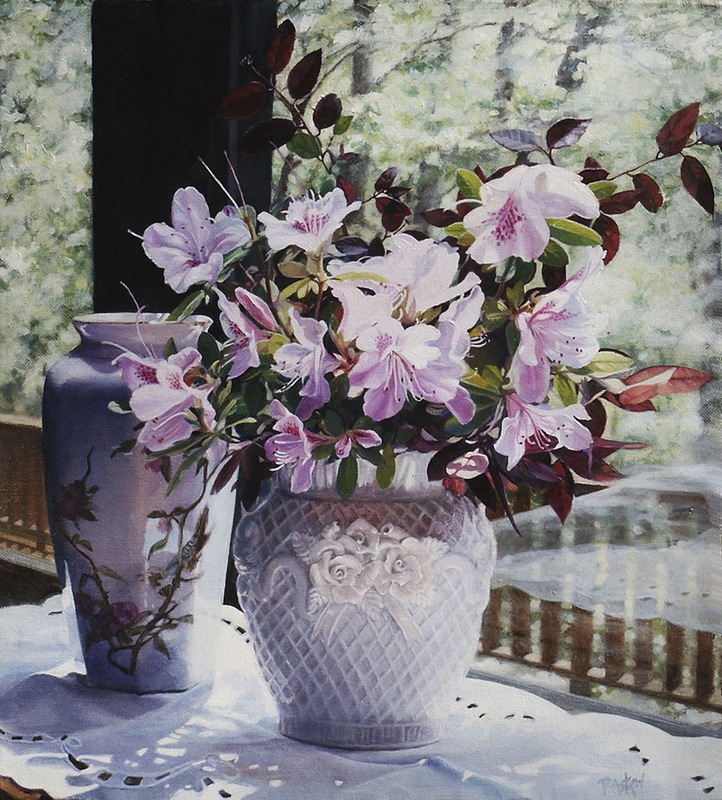 I added a second, empty vase for interest and decided to include the faint reflections in the window. I have long enjoyed painting orchids. 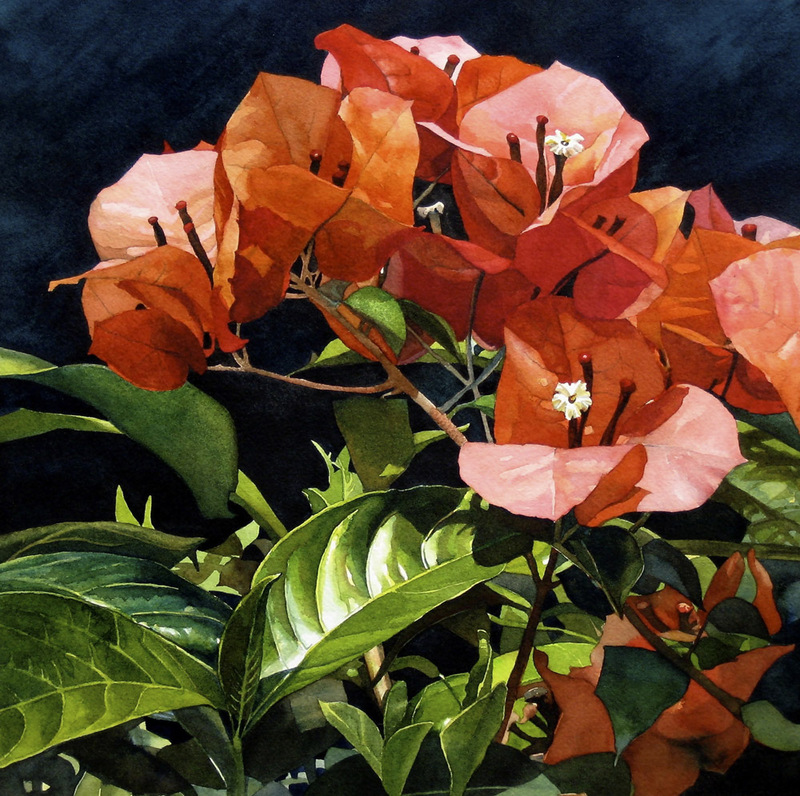 Their majestic appearance, the variety of shapes and colors, the beautiful juxtaposition of size and shape to the large leaves has provided me with inspiration for numerous paintings over the years. 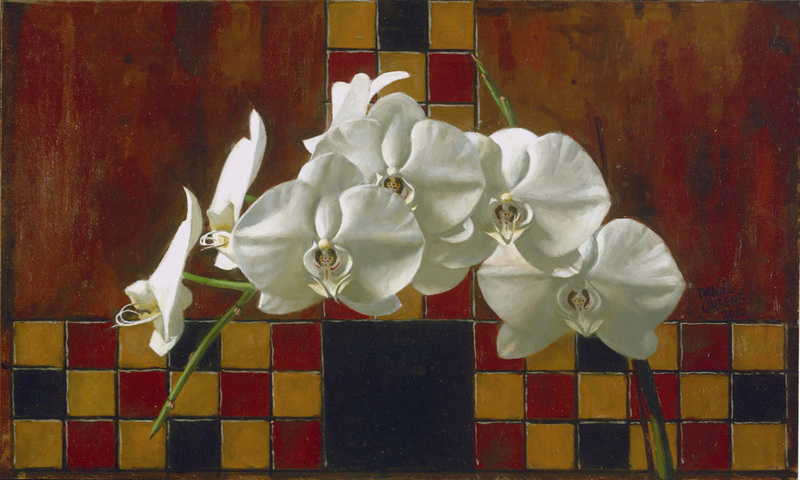 The painting “White Orchids – 2010” evolved from my dual interest in antique gameboards from the Civil War era with their squares and earth tones, contrasted to the beautiful curves and delicacy of the silken-like orchids. The composition is basically rectangular to emphasize the curvature of the flowers when they are bathed in a beautiful north light. My wife Mary Jane and I took a vacation to Jamaica some 30 years ago. We were both so taken with the profusion of beautiful tropical flowers that, after we got back, she soon found a mail order source for many of the plants we had seen which she began growing in our small greenhouse. This bougainvillea plant was one of those early small plants that has rewarded us every winter since with a profusion of red-orange bracts, surrounding the tiny white blossoms. I was inspired by the sometimes translucent, papery quality of the bracts as well as the subtle shading of brilliant colors, from pale pink to fiery orange to violet, all within a single cluster. My inspiration began with photos taken over seven days in spring of this year. I was amazed upon close examination to see the many color variations and details of each bud and blossom of the ‘rescued azalea’ from the wild as it transitioned. 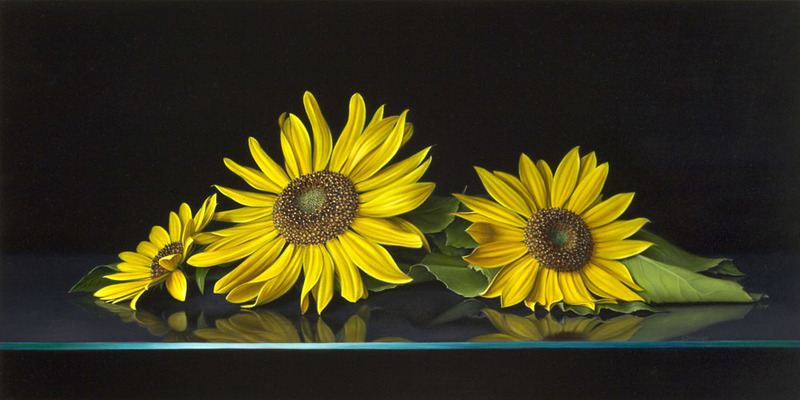 The beautiful sunflowers in “Nature’s Magic” were an absolute joy to paint. I was first attracted by the bright yellow dollops of color sitting atop sturdy stalks that rose above the other foliage in the yard. Only after I got them in my studio did I appreciate the elegance that the sunflowers emanate. The way the delicate petals twist and turn creating subtle nuances of color. The large leaves gently fold under the weight of the flowers as they lay on the glass. The intricate seed pods were a challenge to capture, but very interesting in their construction. Nature has truly created magic in these lovely specimens. My goal in painting “Nature’s Magic” was to preserve the beauty of the blossoms and the emotions they provoke.